There were quite a few stories to emerge out of this weekend's NASCAR races at Daytona, like Danica Patrick's history-making lap and the horrific crash at Saturday's Nationwide Series race. 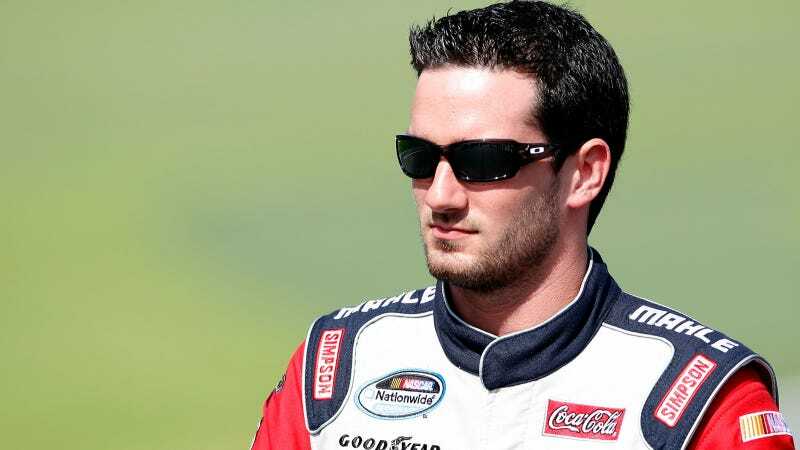 But one story that is just now coming to light is the "indefinite suspension" of driver Jeremy Clements over some remarks he made in an interview. News reports indicate it was some kind of racial slur. So what exactly did he say? "During the course of an interview, Jeremy Clements made an intolerable and insensitive remark," said Steve O'Donnell, NASCAR senior vice president of racing operations. "NASCAR has a Code of Conduct that's explicitly spelled out in the 2013 NASCAR Rule Book. We fully expect our entire industry to adhere to that Code." The suspension was issued Wednesday. ESPN.com has a few more details about what happened. Clements told them he made the comment on Saturday after the Nationwide driver's meeting. He placed 33rd in that race. After the driver's meeting, Clements said he was approached by a NASCAR employee who was escorting a reporter from MTV. The reporter asked him where driver Joanna Long's transporter was, and he walked them over there and continued to talk to them. "And while we're walking they started, he (MTV) started, asking me questions," Clements said. "And it wasn't recorded. We were just talking. So I said one remark about how I wouldn'..."
"I can't say that part," he said. "That's pretty much how it happened," he continued. "And even after I said what I said, they still kept asking me questions. It didn't seem like it was a big deal at all. I didn't even think twice about it, like, after. I know I shouldn't have said it. Even when I did say it, I shouldn't have said it. But I didn't think it was going to be a big deal." Earlier in the story, ESPN pressed Clements on whether the remark was "racial or not." He said it was, but declined to elaborate. Clements would not verbalize the specific comments he made, but when pressed for clarity about whether or not it was racial he paused. Asked again by ESPN.com: "Was it racial or not? Maybe not in context, but in term?" Clements replied: "Correct." "When you say racial remark, it wasn't used to describe anybody or anything," Clements said. "So that's all I'm going to say to that. And it really wasn't. I was describing racing, and the word I used was incorrect and I shouldn't have said it. It shouldn't be used at all." It's not clear how the remarks came to light. Clements seems to imply that either the reporter or the NASCAR employee reported it to the governing body. His comments have not yet been printed or aired. Clements apologized in a statement, and said "I will do what I need to do in order to atone for my error in judgment," but declined to go into the specifics of what he said. Why should anyone care what he said? Aside from natural curiosity, there's the fact that Clements' comments — whatever they were — just add to the stigma of racism that has long been a part of NASCAR, and one that the sport has fought hard against. Controversial remarks from drivers and fans, waving Confederate flags at races, and allegations of discrimination are just some of the issues that have plagued NASCAR even in recent years. If we — and the drivers — don't know what it is that got Clements into hot water, how will we know what the sport's standards are? How can drivers avoid breaking the rules if they don't know how the rules were broken? Also, as Gluck points out, this is kind of an interesting case. Clements doesn't make it seem like the interview was recorded or filmed (though he's not clear whether the reporter was taking notes), so was this truly an interview? Or just an off-the-cuff remark made to someone who happens to be a journalist? And if so, will this make the drivers less willing to talk to the media? I certainly hope that won't be the case. At any rate, probably the best thing for NASCAR to do at this point is to shed light on what Clements said, not to bury it. It's the only way to show the world that they mean business about eliminating the weird racial stigma that has plagued it for too long. If they are serious about doing that, they need to tell the world what was said and show us all what's acceptable and what's not. UPDATE: As of yet, no one has mentioned who the reporter was that Clements made these comments to. Right now there is evidence to suggest it was Marty Beckerman, who was posting about the race this weekend at MTV's Guy Code Blog. Beckerman appears to have been the only MTV journalist at Daytona this weekend. And recall that Clements said a male reporter was looking for Joanna Long's transporter. Beckerman posted this interview with Long on Monday afternoon. I just sent Beckerman an email asking to get in touch. I am curious what Clements actually said and why it hasn't been reported yet. UPDATE 2: Marty Beckerman confirmed he was the reporter to us via email and said a story about the comment was coming soon, and that it will include an explanation of what was said.